Hellichova 5, 11000 Prague, Czech Republic. 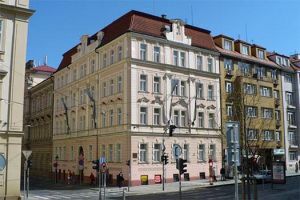 Hotel William offers a fairy-tale atmosphere and maximum comfort in the spacious and luxuriously equipped rooms will surely be the best choice for the stay in the historical part of Prague. It is in an ideal location in the historical part of Prague called Mala Strana (the Lesser Town), just few steps from the Prague Castle, the Charles Bridge, the Malostranske Square or the National Theatre. You can go for the romantic walks on the embankment of river Vltava or sit in some of the neighbouring Cafés, restaurants or pubs. The main historical and cultural monuments are within walking distance. Parking is available next to Hotel William. Free high-speed Internet access is available in all the rooms. Paid public parking near the hotel (covered) (15.00 km). Near trainstation, Centre, Museum Area, Near the historic centre, Lake, Near subway / tramstation.